The Green Pump Handle Is Not Always Diesel. Amidst a tiring and stressful trip hauling your fifth wheel, you stop into a gas station to fill-up with diesel. You look for the green diesel pump and start your fill-up. Unfortunately this gas station has gas and diesel on the same pump and there pump handles are all green. You grabbed the green handle thinking it was diesel when in fact it was gasoline. You get back in the truck and proceed on your trip. After less than a mile you hear strange noises coming from the engine. Gasoline has entered the engine. Now what? Unfortunately the above scenario is not far and few between. Gas stations do not always adhere to the "green is diesel" color coding and it is fairly easy to pump gasoline into your diesel truck. Once gasoline enters a diesel engine, the diesel engine will need to be over hauled with a fuel contamination kit by the dealer. The dealer will apply a step-by-step process whereby all the parts in the engine that would have been affected by the gasoline are replaced. Approximate price to install the kit is between $8,000 and $10,000 and takes about 4-5 days. That includes the kit price and labor, of which the labor will be the higher amount. One thing to know about this type of unfortunate incident is that it may be covered by your insurance. The key words to use when speaking to your insurance company are "Accidental Fuel Contamination". Make sure you use those words in all dealings with the insurance company. You will probably have to pay a deductable but will not have to fit the bill for the rest of the amount which can be substantial. Not many people realize that insurance may cover this so do not think to ask or put in a claim. When getting ready to pump diesel into your truck, come up with a standard procedure that might help eliminate a mistake. Never go by the color of the pump handle. 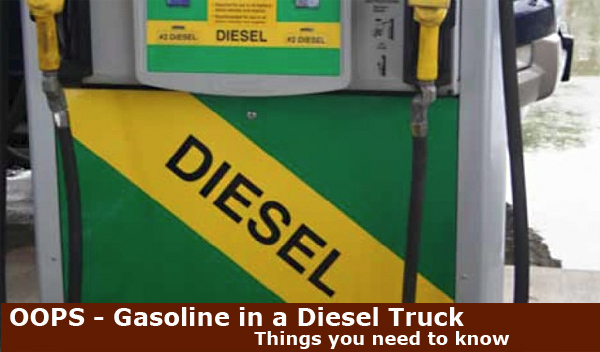 Always make sure you look for the word "diesel" on the pump handle you are going to be using. It is very easy to get into a routine where green means diesel and then we don't look any further than that. 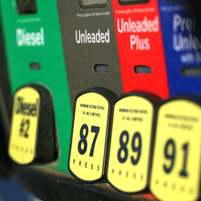 In different states green does not always mean diesel and diesel pump handles can be green, yellow, orange or any other color and many gas stations have green gasoline pump handles as well as green diesel pump handles. If you accidentally pump gasoline and do not start the truck before realizing what happened, it may be possible to drain the fuel tank before any damage is done. Either way, hold onto your wallet. it's gonna hurt.